On March 21, the National Network to End Domestic Violence (NNEDV) joins the global community in observing the International Day for the Elimination of Racial Discrimination. We recognize the importance of challenging racial injustice in our fight to end domestic violence. “Injustice for one is injustice for all.” – Dr. Martin Luther King, Jr.
1. Learn to recognize and understand your own privilege. 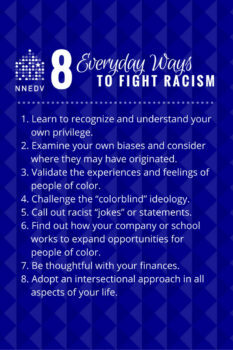 One of the first steps to eliminating racial discrimination is learning to recognize and understand your own privilege. Racial privilege plays out across social, political, economic, and cultural environments. Checking your privilege and using your privilege to dismantle systemic racism are two ways to begin this complex process. However, race is only one aspect of privilege. Religion, gender, sexuality, ability-status, socio-economic status, language, and citizenship status can all affect your level of privilege. Using the privileges that you have to collectively empower others requires first being aware of those privileges and acknowledging their implications. Learn more about the many types of privilege. 2. Examine your own biases and consider where they may have originated. What messages did you receive as a kid about people who are different from you? What was the racial and/or ethnic make-up of your neighborhood, school, or religious community? Why do you think that was the case? These experiences produce and reinforce bias, stereotypes, and prejudice, which can lead to discrimination. Examining our own biases can help us work to ensure equality for all. We encourage you to check out the PBS documentary, Race: The Power of Illusion, which tackles the social construct of race in the United States. 3. Validate the experiences and feelings of people of color. As advocates, we learn about domestic violence by listening to survivors of domestic violence. Similarly, the best way to understand racial injustice is by listening to people of color. 4. Challenge the “colorblind” ideology. It is a pervasive myth that we live in a “post-racial” society where people “don’t see color.” Perpetuating a “colorblind” ideology actually contributes to racism. When Dr. Martin Luther King, Jr. described his hope for living in a colorblind world, he did not mean that we should ignore race. It is impossible to eliminate racism without first acknowledging race. Being “colorblind” ignores a significant part of a person’s identity and dismisses the real injustices that many people face as a result of race. We must see color in order to work together for equity and equality. 5. Call out racist “jokes” or statements. Let people know that racist comments are not okay. If you are not comfortable or do not feel safe being confrontational, try to break down their thought process and ask questions. For example, “That joke doesn’t make sense to me, could you explain it?” Or “You may be kidding, but this is what it means when you say that type of thing.” Do not be afraid to engage in conversations with loved ones, coworkers, and friends. Microaggressions, which can appear in the form of racist jokes or statements, perpetuate and normalize biases and prejudices. Remember that not saying anything – or laughing along – implies that you agree. 6. Find out how your company or school works to expand opportunities for people of color. Systemic racism means that there are barriers – including wealth disparities, criminal justice bias, and education and housing discrimination – that stack the deck against people of color in the workplace or at school. For example, the African American Policy Forum (AAPF) reported that in 2014, a 12-year-old girl faced criminal charges, in addition to expulsion from school, for writing “hi” on a locker room wall. Their campaign, #BlackGirlsMatter, addresses the issues of overpoliced and underprotected Black girls within the education system. It is important for companies and schools to address these issues and promote a culture of equity. 7. Be thoughtful with your finances. Take a stand with your wallet. Know the practices of companies that you invest in and the charities that you donate to. Make an effort to shop at small, local businesses and give your money back to the people living in the community. Your state or territory may have a directory of local, minority-owned businesses in your area. 8. Adopt an intersectional approach in all aspects of your life. Remember that all forms of oppression are connected. You cannot fight against one form of injustice and not fight against others. Many survivors of domestic violence also face racism and other forms of oppression. We must recognize and support survivors’ unique experiences. 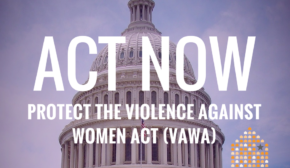 Learn more about domestic violence and how you can help end it at NNEDV.org/GetInvolved. 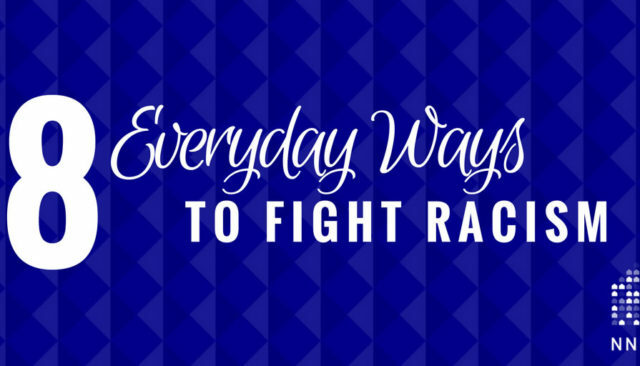 * Learn more about how racial discrimination impacts survivors. Follow NNEDV on Pinterest. We have a Racial Justice Pinterest Board discussing racial justice themes that impact survivors. Join our online book club, Reader with a Cause! We engage in conversations about popular books and themes including racial justice, domestic violence, and sexual assault.